The Guardian reports, 23rd December 2017: New super corals bred by scientists to resist global warming could be tested on the Great Barrier Reef within a year as part of a global research effort to accelerate evolution and save the “rainforests of the seas” from extinction. Researchers are getting promising early results from cross-breeding different species of reef-building corals, rapidly developing new strains of the symbiotic algae that corals rely on and testing inoculations of protective bacteria. They are also mapping out the genomes of the algae to assess the potential for genetic engineering. Innovation is also moving fast in the techniques need to create new corals and successfully deploy them on reefs. One breakthrough is the reproduction of the entire complex life cycle of spawning corals in a London aquarium, which is now being scaled up in Florida and could see corals planted off that coast by 2019. “It is a story of hope, rather than saying ‘it’s all going to die and there’s nothing we can do about it’,” said Prof Madeleine van Oppen, from the Australian Institute of Marine Science and the University of Melbourne. The researchers, who presented their cutting-edge work at a conference at the University of Oxford last week, acknowledge that such serious biological interventions on coral reefs could be seen as controversial or risky. Coral reefs are critical ecosystems in the oceans, hosting more than a million species and sustaining natural services worth $10tn a year, including providing vital food for 500 million people. But climate change is heating the oceans and causing corals to bleach: reefs could die out as early as 2050, with perhaps half already gone. The global coral bleaching catastrophe from 2014 to 2017 was the worst in recorded history. One of the most promising is coral hybrids, and new experiments by Van Oppen’s team have shown that corals adapted to cooler water can be crossed with other species from warmer regions so that the hybrids withstand heat better. “I am very excited because the results are so promising,” she said, adding that she expects the forthcoming research paper to be the first on the topic. The team have now applied for a permit to test the hybrids on the Great Barrier Reef, potentially within a year. “I am hopeful that in the 2018 spawning, which is late in the year, we can place some of them out in the field,” van Oppen said. Another approach is to toughen up the symbiotic algae that live in the coral animals’ tissues and provide them with food. Leela Chakravarti, one of van Oppen’s team, pushed the algae through 80 generations in the lab, each time selecting for the most heat tolerant, and produced symbionts that could survive 31C water temperature. The experiment proved the concept and now the team looking for ways for the corals themselves benefit from the rapidly evolved algae. Corals, like most animals, also rely on beneficial bacteria — probiotics — and Raquel Peixoto, at the University of Rio de Janeiro in Brazil, has shown that inoculating corals with a cocktail of 10 hydrocarbon-eating bacteria helps them survive oil spills. Van Oppen’s team is about start similar work but using bacteria that mop up the damaging reactive oxygen molecules produced when corals are under stress and start to bleach. The promise here is that it might one day be possible to spray probiotics on a reef to strengthen it — a much simpler approach than growing and planting corals. Genetic engineering is also being explored, as it may be a fast way to get protective genesA string of the DNA (deoxyribonucleic acid) molecule that is the fundamental unit of inheritance, so it is variations in the make up of this molecule in the gene that controls variations in an organism's appearance and behaviour. Genes are found in the nucleus of the organism's cells. into corals and symbiotic algae. “We are starting to see what is possible in the laboratory,” said van Oppen and the group are already decoding the genomes of some symbionts. While super corals are starting to be produced in the lab, if they are to help restore reefs they will have to be successfully delivered in large numbers. But new techniques are being rapidly developed in this area too. 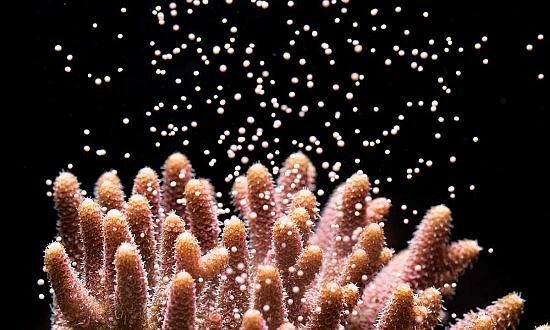 In November, the first research to replicate the entire life cycle of a spawning coral in a closed system was published by James Craggs, who did the work at the Horniman Museum in London, thousands of miles from the source reefs in Singapore and Australia. As the Guardian spoke to Craggs in Oxford, his team at the museum were busy hybridising the two corals. A key aim of Craggs’s work is to accelerate research on the mysterious factors that control spawning — a combination of temperature, sunlight, lunar cycles and more. In the oceans, this often happens on just one day a year and is therefore incredibly hard to study. But Craggs is now aiming to produce a spawning event every month and his techniques are being scaled up in Florida, where two of eight large greenhouses have been built to house breeding tanks. Other new technology presented at the Oxford conference included three-pronged concrete bases to grow corals on in tanks, which can then be wedged into reefs without time-consuming ties or glue. Another is a “badminton technique” for delivering small tank-grown corals to trawler-damaged habitats deep in the Mediterranean. “The fan shape of the coral acts like a badminton shuttlecock and slows the descent, allowing a good landing,” said Maria Montseny, at the University of Barcelona. Researchers say ‘source reefs’ could produce larvae and help repair damage by bleaching and starfish. The damage to reefs around the world is on a vast scale, while expensive restoration efforts will always be relatively small, But scientists have discovered that in reef systems, just a small part of the reef is often the source of many of the new larvae, so focusing efforts there will have a much bigger impact. This is an understatement of the facts. In the first instance, trying to breed global warming resistant coral and associated species of this ecosystem in the laboratory for “seeding in the wild” is akin to trying to manage the evolution of life. It is founded on a belief that we can manage nature when, due to man-made global warming, we have corrupted nature from its natural course; and, it is founded on a belief that we can bring nature back into a new equilibrium where, in this instance, coral and its hugely diverse ecosystem may once again prosper. This may be regarded by these scientists as an “ecosystem approachAn ecosystem-based approach to management represents a new and more strategic way of thinking. It puts the emphasis on a management regime that maintains the health of ecosystems alongside appropriate human use of the marine environment, for the benefit of current and future generations. This requires setting clear environmental objectives both at the general and specific level, basing management of the marine environment on the principles of sustainable development, conservation of biodiversityBiological diversity in an environment as indicated by numbers of different species of plants and animals., robust science, the precautionary principle and stakeholder involvement. Ref, DEFRA, Safeguarding Our Seas, section 1.17 (2002)” — the ecosystem approachAn ecosystem-based approach to management represents a new and more strategic way of thinking. It puts the emphasis on a management regime that maintains the health of ecosystems alongside appropriate human use of the marine environment, for the benefit of current and future generations. This requires setting clear environmental objectives both at the general and specific level, basing management of the marine environment on the principles of sustainable development, conservation of biodiversityBiological diversity in an environment as indicated by numbers of different species of plants and animals., robust science, the precautionary principle and stakeholder involvement. Ref, DEFRA, Safeguarding Our Seas, section 1.17 (2002) being a key tenet in the principles of conservation management — but these scientists are profoundly wrong. This action is not a product of the principles of the ecosystem approachAn ecosystem-based approach to management represents a new and more strategic way of thinking. It puts the emphasis on a management regime that maintains the health of ecosystems alongside appropriate human use of the marine environment, for the benefit of current and future generations. This requires setting clear environmental objectives both at the general and specific level, basing management of the marine environment on the principles of sustainable development, conservation of biodiversityBiological diversity in an environment as indicated by numbers of different species of plants and animals., robust science, the precautionary principle and stakeholder involvement. Ref, DEFRA, Safeguarding Our Seas, section 1.17 (2002) to conservation and marine management. The ecosystem approachAn ecosystem-based approach to management represents a new and more strategic way of thinking. It puts the emphasis on a management regime that maintains the health of ecosystems alongside appropriate human use of the marine environment, for the benefit of current and future generations. This requires setting clear environmental objectives both at the general and specific level, basing management of the marine environment on the principles of sustainable development, conservation of biodiversityBiological diversity in an environment as indicated by numbers of different species of plants and animals., robust science, the precautionary principle and stakeholder involvement. Ref, DEFRA, Safeguarding Our Seas, section 1.17 (2002) is founded on the belief that we do not attempt to manage natural ecosystems — nature does that, whether for “good or ill”. Rather the ecosystem approachAn ecosystem-based approach to management represents a new and more strategic way of thinking. It puts the emphasis on a management regime that maintains the health of ecosystems alongside appropriate human use of the marine environment, for the benefit of current and future generations. This requires setting clear environmental objectives both at the general and specific level, basing management of the marine environment on the principles of sustainable development, conservation of biodiversityBiological diversity in an environment as indicated by numbers of different species of plants and animals., robust science, the precautionary principle and stakeholder involvement. Ref, DEFRA, Safeguarding Our Seas, section 1.17 (2002) manages human activities and their impact on natural ecosystems. In short, it focuses on human behaviour, not the manipulation of nature. Therefore it is clear that this intervention and proposal to introduce laboratory-bred coral into the wider coral ecosystem is profoundly misguided because it is founded on a false premise. We cannot manage nature. We can only manage ourselves. This is the principle of conservation that this “lab-bred” approach to conservation is contradicting. Not only is it extraordinarily arrogant of us to believe that we can repair the damage we are doing to nature by engineering nature into a solution, it is also profoundly stupid. The scientists involved in this project may believe that they can accomplish this, but actually they are suffering from that age-old human weakness — hubris. In other words, the belief that their cleverness makes them omnipotent. They are in for a rude awakening. The only solution to this problem of coral death due to global warming is to tackle the problem of global warming itself. To eliminate the cause. This means addressing the human behaviour that is producing the problem in the first place. This is what scientists should be doing. This is the real solution to natural ecosystem collapse. In any case, what do these scientists expect to happen if they “breed” a coral capable of surviving in warmer seas? Do they think that will provide the solution and be the end of the story? Do they not realise that whilst the oceans are warming due to ever increasing levels of CO2 in the atmosphere, these elevated levels of CO2 are at the same time causing ocean acidification (more accurately, a reduction in the ocean’s natural alkalinity) and that calcareous dependent species which require calcium carbonate for their structure and shells will find it increasingly difficult to survive in a more acidified world? Even if they do realise this, are they also going to solve the problem of the acidification of the ocean by breeding animals (corals) that no longer need to rely on calcareous processes? Of course not. That’s impossible. In short, this whole mind-set of a lab-bred solution is insane. These scientists have forgotten that we — and they — are the cause of the problem, and that you solve a problem by remedying the cause — not the consequence. Finally, they are wrong for an additional equally worrying reason. As the natural world dies, scientists are responding with the belief that they can create new life forms by genetic engineering. These scientists appear to believe that these new genetically engineered species can survive in a world which is now so poisoned that their natural ancestors can no longer do so. In other words, we are attempting to take control of evolution because our behaviour towards the natural world is so misguided that the natural world is dying, and we are trying to convince ourselves that our cleverness can invent the solution to the death of the natural world. Can we really become the masters of evolution, and take on the omnipotence that this belief presupposes? This has all the hallmarks of another dose of hubris, but even more profoundly so. Moreover what is the solution when it is our own selves who start to die due to this pollution of the natural world? Do we start to genetically engineer ourselves because of the urgent need to find an escape from this fatal predicament? That certainly would be a brave new world. Unfortunately, one that rests on a gamble founded on extraordinary arrogance. It is not a gamble Marinet believes in. Rather, let us focus on the true principles of the ecosystem approachAn ecosystem-based approach to management represents a new and more strategic way of thinking. It puts the emphasis on a management regime that maintains the health of ecosystems alongside appropriate human use of the marine environment, for the benefit of current and future generations. This requires setting clear environmental objectives both at the general and specific level, basing management of the marine environment on the principles of sustainable development, conservation of biodiversityBiological diversity in an environment as indicated by numbers of different species of plants and animals., robust science, the precautionary principle and stakeholder involvement. Ref, DEFRA, Safeguarding Our Seas, section 1.17 (2002) to marine management. Namely, eliminate the human activity that is causing the problem. That is the real solution. Indeed, the only solution. Only, who is going to tell the professors and doctors of science whose eyes are locked via their microscopes onto the genetic structure of life which they are brazenly trying to manipulate…?